Yang Yan Gou Qing is an exceptional Green tea which originates from the Yang Yan Mountains in Lin Hai City of Zhejiang province. This tea is very rare, the yearly production is only about ten percent that of Xi Hu Long Jing's. The name Gou Qing (translates to Green Hook) is given due to the special hook-like appearance of its tea leaves. This tea was recently entitled "Jian Nan Di Yi Gou Qing Cha" (meaning Southern China's top Gou Qing tea) by the president of the International China Tea Cultural and Research Center, Mr. Wang Jia Yang; and was also awarded the Zhejiang's Top Brand Award. Our first flush Yang You Gou Qing is "Te You" or Superior grade (limited stock available). An outstanding tea with unique characteristics that rival China's Ten Famous Tea. Yang Yan Gou Qing is a highly aromatic tea with a smooth and delicately sweet taste. 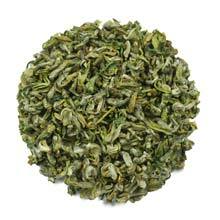 Downy, small, curvy tea leaves that unfurl into fresh green color leaves with one-bud and one-to-two leaves when infused.